Sing We Now of Christmas! 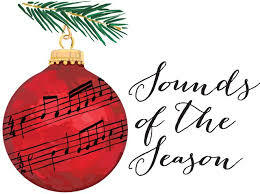 Join us on Sunday, December 16 at 3:00 pm at Sacred Heart Church for an afternoon of musical entertainment brought to you by the Music Ministry of Sacred Heart, Our Lady Star of the Sea and St. Gerard’s. God has gifted our parishes with a diverse range of musical talent. As we take great pride in singing to the Lord all year long, on this Sunday afternoon we sing for your pleasure and enjoyment. It is our hope that your day will be enriched by our diverse program showcasing the eclectic styles of music that brings us joy. The afternoon features the precious voices of the Sacred Heart and Our Lady Star of the Sea Children’s choir, as well as the masterful sound of the adult choirs from Sacred Heart, Our Lady Star of the Sea and St. Gerard’s. There is no charge for the event, however, a free will offering will be taken for the benefit of our local St. Vincent de Paul Society, a 501c non-profit organization.